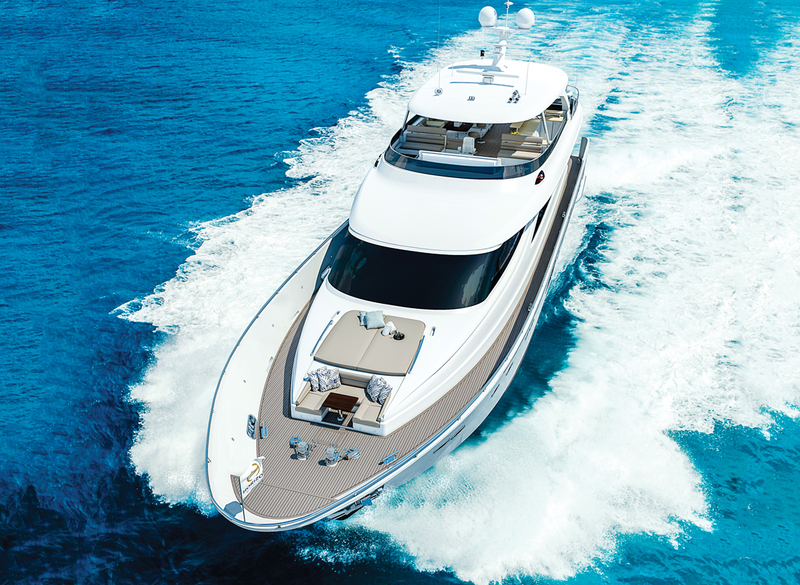 A new E Series flagship extends Horizon’s motoryacht line. Not a builder to rest on its laurels, Horizon has been busy expanding its series, from the new Power Cat line to the Fast Displacement line. And even within existing series, Horizon keeps things fresh, as borne out by the new E98, a motoryacht that sits atop the nine-model E series as the flagship. With four staterooms — including a master that spans the 23-foot, 2-inch beam — that all include en suite heads, and room for three or four crew, the E98 can definitely serve as a family-style cruiser. The main deck houses a large salon, a formal dining area, a full galley and a country kitchen. 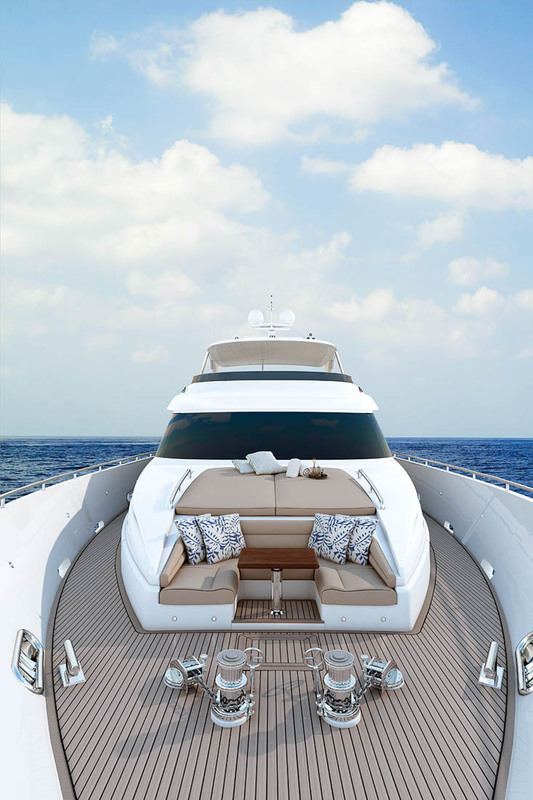 Plus, the aft deck extends the main cabin’s social scene all the way to the transom. The layout, according to the builder, is customizable, so owners will get the interior they want. 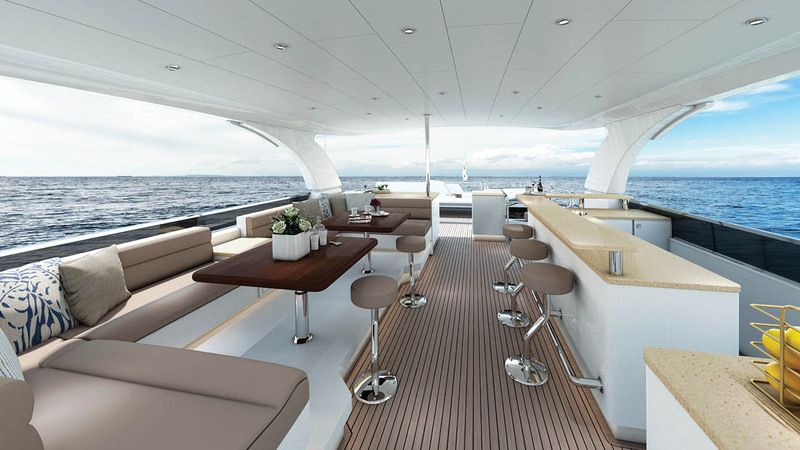 A bow social area with a double sunpad and a settee for four or five adds to the outdoor space, which includes the flybridge, if the open version is chosen. The flybridge can be open or fully enclosed as a skylounge, depending on the owner’s preference and probably his cruising location, but either way seating is abundant on a C-shaped settee, a single captain’s chair, double companion seats to either side and five barstools bellied up to an L-shaped bar. A commercial icebox and a high-low barbecue grill ensure everyone on the bridge will have food and drink. Twin 1,600 hp Caterpillar C32 diesels are standard, but the owner of hull #1, which will be delivered in early 2017, opted for 1,900 hp CAT diesels, which should yield 22.5 knots at half load, according to Horizon. LOA 99 ft., 6 in. Beam 23 ft., 2 in. Orange Coast Yachts, Newport Beach, Calif.
Orange Coast Yachts, Alameda, Calif. This entry was posted in Snapshot, New Boats by bsheehy. Bookmark the permalink.